Bottle Art Won't Make You Cooler. But If You're Already on a Modding-Spree, It Can't Hurt. 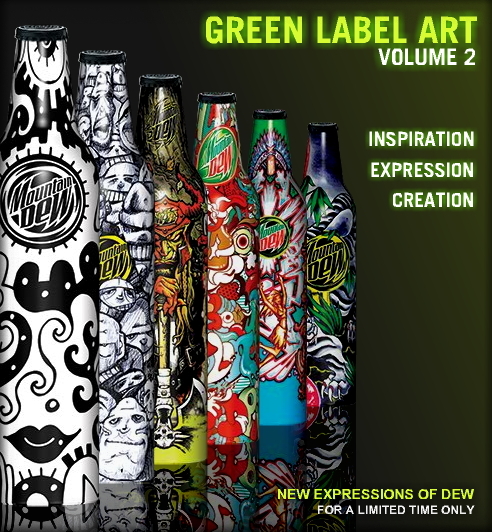 When last we reviewed Mountain Dew's Green Label Art project, its trussed-up bottles were gleaning inspiration from mean tattoos and revisiting their hillbilly roots with artist Peat Wollaeger. 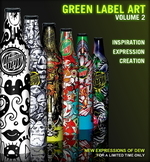 The bottle art in Green Label Art Volume 2 is slicker and more computer-graphicksy. There's also a batch of new proteges on call, including Mike Sutfin, who's done artwork for Dungeons & Dragons and skate brands like DC; and Mark Smith, CD at Jordan (yes, THE Jordan) Brand. Smith's bottle design, Happy Heads, almost matches my Macbook Gelaskin (now with matching iPhone skins!). Beverage + tech coordination = total identification with the idle style aristocracy. Modding every item in your Muji bag may not send you to heaven, but it will distinguish you from the other cafe/cubicle cogs that also use Macs, own iPhones and drink cold beverages. And getting a foot in front of them is about as close to heaven as you can get if you're alive, agnostic, overpaid and insecure. View galleries and artist videos, or create your own bottle art at the website (tutorial here).